May I introduce, Hugh LeCaine. As I troll around for Hammond Solavoxes and Novachords for my own projects, I must state here that THE ELECTRONIC SACKBUT WAS THE FIRST VOLTAGE CONTROLLED SYNTHESIZER, not some univox organ a dude is selling on ebay, despite what the ebay page claims. Although the novachord, clavioline, ondioline, trautonium, are all beautiful, LeCaine made a synthesizer with voltage control of things like filters, VCAs and pitch before 1950!!! This technical touch of voltage control allowed the integration of all sorts of nuanced control of the instrument without the need to discretely switch components in the circuit or contrive complicated mechanical variable capacitors and inductors (as used on some other instruments of the time ie, martenot’s string). Gotta love the look, too. 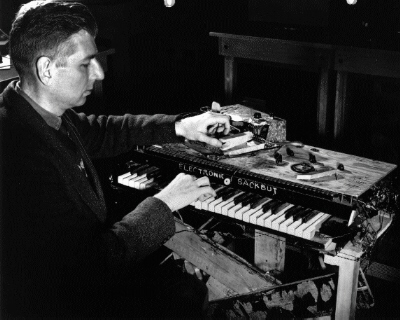 Visit http://www.hughlecaine.com/en/ to see the many more interesting and trippy sound machines invented by this nuclear physicist. 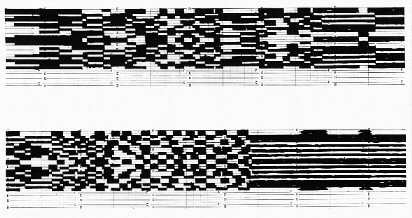 Bird Chirp to be read by LeCaine "Spectrogram" and played by "Oscillator Bank"
And, yes, this was all done with tubes – what would you use in 1945?